Ms. Emily supervises the children after school, leads nature hikes, and helps care for the classroom animals, gardens, and fruit trees. She has worked as an environmental educator since 2001. 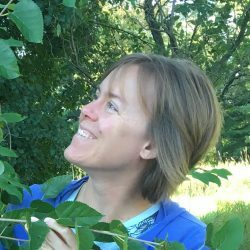 She graduated from Valparaiso University with a degree in biology and is a WI Master Naturalist. She lives in Madison with her husband and cat. Her interests include growing and eating fruit, reading, contra dancing, and talking like a pirate.